From campus to coal to tourism, the work of Aubrey D. May is seen throughout Kentucky. Mr. May, a native of Pikeville, Kentucky, graduated with high distinction from the University of Kentucky in 1958, earning a Bachelor of Science degree in civil engineering. He earned a Master of Science degree in the same discipline in 1960 with a 4.0 GPA. He was a member of engineering honor societies Tau Beta Pi and Chi Epsilon. Mr. May entered UK on a Highway Department Scholarship and later received two Kentucky Section of American Society of Civil Engineers scholarships. Upon completing graduate school, he was head of the soils section in the highway department’s research laboratory, then housed on campus in what is now the D.V. Terrell Building. In 1960 Mr. May joined Stokley and Associates, Engineers and Geologists, founded by Dr. John A. Stokley, Mr. May’s geology professor at UK. As chief engineer, Mr. May was responsible for geotechnical engineering studies on sections of the Western Kentucky, Mountain, and Bluegrass Parkways; Interstates 64, 264, 71, 75, 275, and 24; and numerous building projects, including the tower addition to the College of Engineering (1964) and the UK Business and Economics building (1962). Mr. May also had geotechnical engineering responsibility at FMSM Engineers for a 1991 addition to the B & E building. 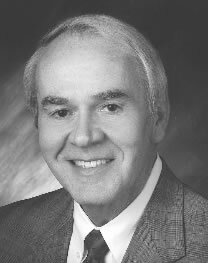 Mr. May joined the consulting civil engineering firm of Fuller, Mossbarger and Scott in 1971, and became vice president of the firm, then Fuller, Mossbarger, Scott and May, in 1973. Now FMSM Engineers, the firm grew from a dozen people in 1971 to 250 dedicated employees at the time of Mr. May’s retirement at the end of 2000. FMSM Engineers offers services in civil, environmental, waste management, water resources, mining, underwater structure inspections, materials testing, construction monitoring and geographic information systems applications. Mr. May’s responsibilities included: co-management of the firm; liaison for the Louisville, Cincinnati and Columbus branch offices; and principal management of the firm’s geotechnical engineering projects. These included 15 sections of AA Highway; upgrades of U.S. 119, 150, 421, and 68; new bridges over the Ohio River at Cincinnati, Owensboro and Maysville; U.S. 27 and KY 90 bridges over Cumberland Lake; and several sections of I-75 widening. Many familiar structures in Central and Eastern Kentucky are part of Mr. May’s work. He managed or conducted hundreds of geotechnical engineering assignments, including the former Island Creek Coal Company Headquarters, Jerrico Corporation Headquarters, the Kentucky Horse Park, Christ United Methodist Church and Dunbar High School in Lexington; Pikeville High School and First National Bank in Pikeville; Todd Street Connector, the Floral Clock at the state capitol and the Kentucky Vietnam Veterans Memorial in Frankfort; Pier and Fixed Weir Studies of Lock and Dams 52 and 53 on the Ohio River; improvements in the Big South Fork National River and Recreation Area in Tennessee; auditorium/classrooms at Fort Knox; the Mt. Sterling-Montgomery County Airport; and several abandoned mine land (deep shaft mine) projects in Virginia. Mr. May was a charter member and past chair of the Kentucky Geotechnical Engineering Group. He was president of the Bluegrass Branch and Kentucky Section of the American Society of Civil Engineers (ASCE), receiving Professional Recognition and Distinguished Achievement Awards. He was chair of District 9 Council ASCE, and is a past president of the Kentucky Consulting Engineering Council. He received joint recognition with the Kentucky Society of Professional Engineers (KSPE) for “extraordinary efforts toward professional unity among engineers in Kentucky.” Mr. May was a Fellow of the American Consulting Engineers Council and of KCEC. He was active in the Kentucky Association of Professional Surveyors and, in 2000, was named a Life Member in ASCE, KSPE, and, the National Society of Professional Engineers. He was presented the KSPE Distinguished Service Award of 2002. That same year, UK Civil Engineering alumni selected Mr. May for a prestigious Civil Engineering Career Achievement Award. Mr. May was a chair of the Kentucky Board of Licensure for Professional Engineers and Land Surveyors. In 2000, he was chair of a task force that developed an updated Code of Professional Practice and Conduct for licensees. He was honored by the board in 2003 with an unprecedented award in recognition of his service. Mr. May was active in community service, holding leadership positions with the Boy Scouts, youth baseball and Second Presbyterian Church in Lexington. Mr. May died September 12, 2015. He is survived by his wife, Karen, and four children. In 2017, Mrs. May established the Aubrey Donald May Scholarship Fund. The endowment will generate scholarships for civil engineering students who have unmet financial needs and express an interest in the college's University Scholars program. Students must be Kentucky residents and preference is given to attendees from eastern Kentucky counties.